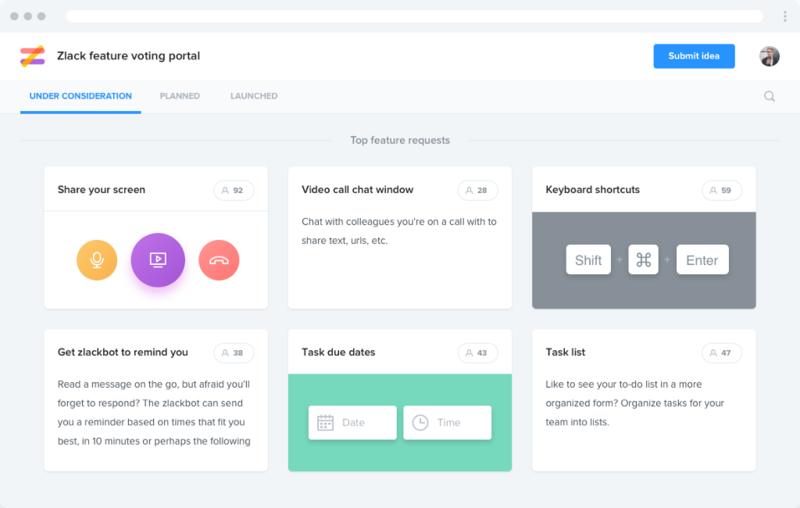 productboard, the all-in-one product management solution, launched today on Product Hunt the Portal, an all-new interface that bridges the divide between product teams and the marketplace. productboard Portal enables product managers to get the pulse of their customers. Since the dawn of their profession, product managers have been charged with investing limited resources into building the right features, designed in the right way, to address problems in the marketplace. But with hundreds, thousands, or millions of users, collecting information about user needs at scale can threaten to overwhelm even the most user-centered team. There are shining examples of organizations that have succeeded — customer-obsessed companies like Invision, Zendesk, and Envoy. productboard’s mission is to scale the best practices employed by these highly effective product organizations (who are all also productboard customers) to product teams across the globe, so that all product managers are better equipped to achieve product excellence. With the Portal, product managers have a public-facing interface where their users can submit requests, and where product managers can gather feedback on feature candidates, share what features are planned, and announce what’s been launched. 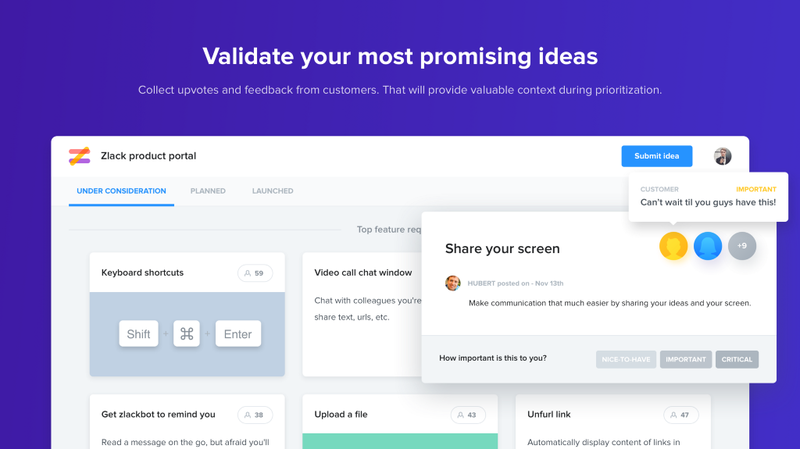 Ideas and feedback submitted by users are automatically routed back to productboard’s Insights board, where they can be analyzed alongside user inputs streaming in from other channels like email, Intercom, Zendesk, and other third party tools via Zapier. Upvotes and feedback provided on features are reflected on the Features board in the form of auto-calculated scores that help product managers prioritize what to build next. For years, product managers were forced to manage their most critical responsibilities in spreadsheets and project management tools like Trello and JIRA. With productboard, they’re now able to make data-driven prioritization decisions based on real user insights and clear strategic criteria, and rally their entire organization around those decisions. The Portal is the final piece of the puzzle, because now product managers have a way to interact directly with their user base and collect feedback at scale. With Salesforce for sales, Marketo for marketing, Zendesk for support, JIRA for engineering, and Workday for human resources, it could be lamented that product managers are the last business function to get a dedicated solution of their own. But we’d be remiss not to mention the growing number of roadmapping utilities and user feedback forums on the market. With the Portal, productboard overcomes limitations of all previous roadmapping and feature voting solutions. productboard Portal engages your product community in a whole new way. And by giving product managers control over which feature ideas are displayed on their Portal and how they’re arranged, productboard tackles the core problems of age-old feature voting forums. Looking to the future, product managers have a lot to look forward to. Jackie Bavaro, the Head of Product at Asana, recently hypothesized that the biggest development in the field over the next five years will be cheaper, faster ways of gathering customer feedback and validating problems so “PMs will be able to make even more informed, customer-focused decisions.” With the productboard Portal, that vision may come to fruition sooner than anticipated. Product excellence awaits. productboard is the all-in-one product management platform that helps teams understand what users need, prioritize what to build next, earn buy-in for their roadmaps, and engage user community in a whole new way. With productboard, teams can consolidate user research & feedback streaming in from a variety of sources, see exactly who’s requested which feature ideas, and push features straight into agile planning tools when ready for development. From its headquarters in San Francisco and offices in Prague, productboard serves hundreds of top-performing product teams worldwide, including Zendesk, Invision, DellEMC, Avast, Sprout Social, and Envoy. productboard is the solution of choice for passionate product teams dedicated to making products that matter.